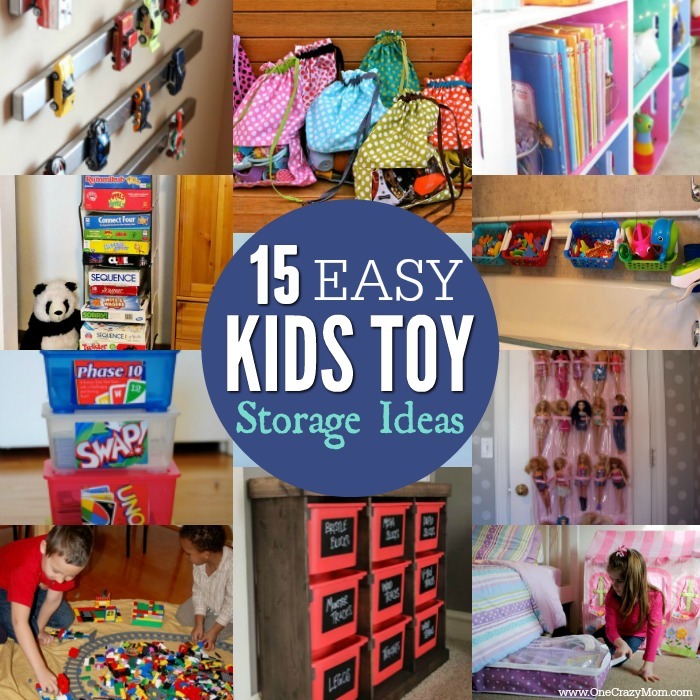 We have 15 Easy Kids Toy Storage Ideas that you will love. 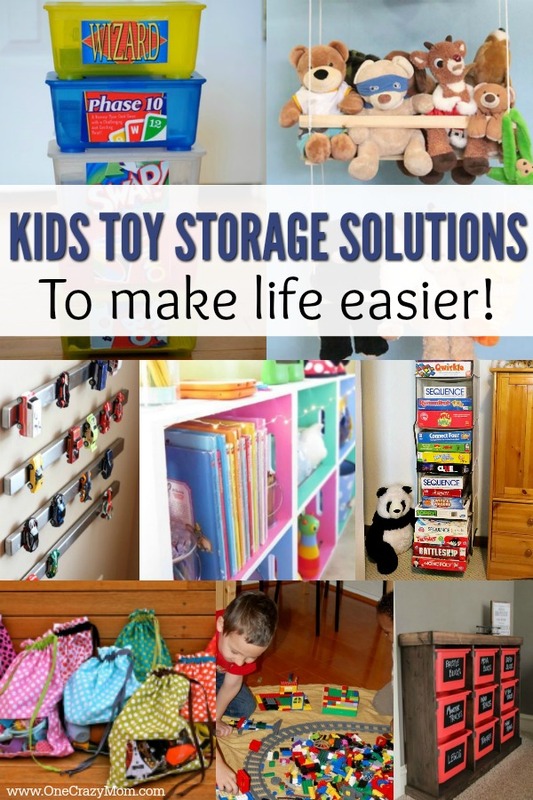 Are you tired of tripping on toys and never knowing where to put things. 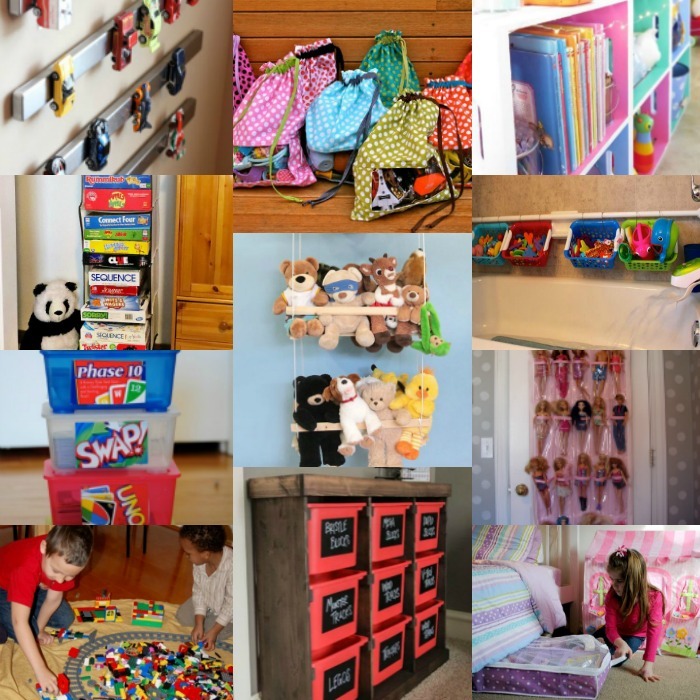 Try these kids storage solutions to bring organization to your home! Many of these storage ideas use items you already have! Toys can so quickly take over a house! It’s overwhelming for kids and adults alike! It brings stress and chaos and frustration for the entire household. 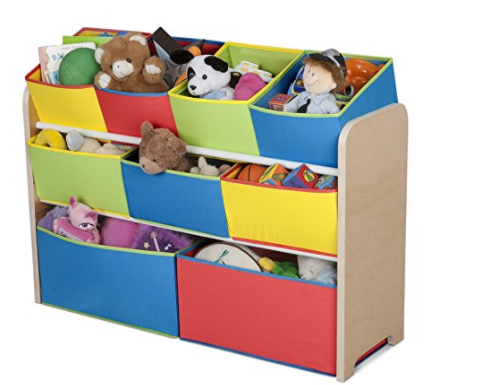 We have Kid’s Storage Solutions that will bring order to all the toys laying around in over filled toy bins! We did this in our house and it helped tremendously. You can imagine with multiple children how quickly the piles of stuff can grow. 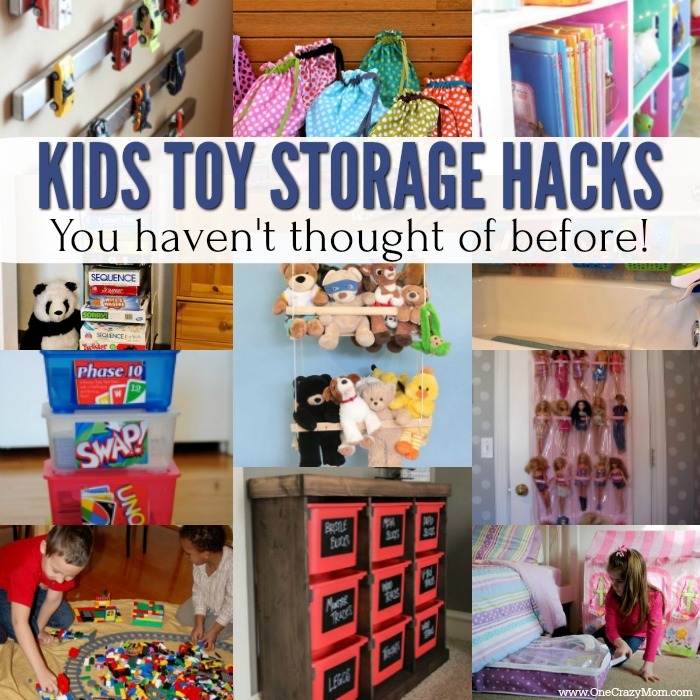 I would encourage you to go through all the toys and games prior to organizing. There isn’t any point in organizing toys that no longer get played with or may be broken. Doing this first should drastically reduce your pile of toys and make this entire project much simpler. I even have an idea to help you organize art work that might be piling up. Try these Amazing Apps for Kids Art Storage. This has greatly helped us to reduce the random piles of paper and art work just laying around. And after you get the kid’s toys in order, mine as well tackle the kitchen! We have 21 Easy Dollar Store Kitchen Organization Ideas here. You can also print off a free Spring Cleaning Checklist to help you stay on track! I find that once your house is in order, everyone is just happier! No one likes to have to walk around clutter or hunt for that item or toy you are looking for. Having a place for everything brings order and less stress to your home. These ideas will really help reduce the clutter laying around. I also love the bins on Amazon for toys. We have one that is perfect for legos, small toys and more! You can see several here that are similar to what we have. Under the bed is a perfect place for toy storage. Use these under the bed containers that fit perfectly. This is ideal for doll clothes and toys or really anything that will fit. You could put toy cars in it or anything! 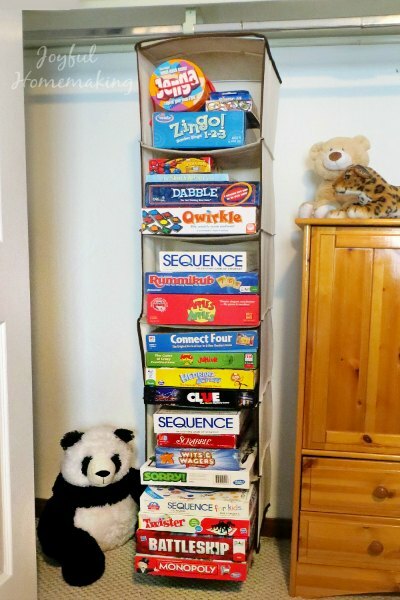 Hanging Shelves are the perfect size games and puzzles. These hang easily in the closet and it is super easy to put games back up. Plus, you can pick up a hanging shelf very inexpensively. Shoe organizers do not have to be just for shoes! 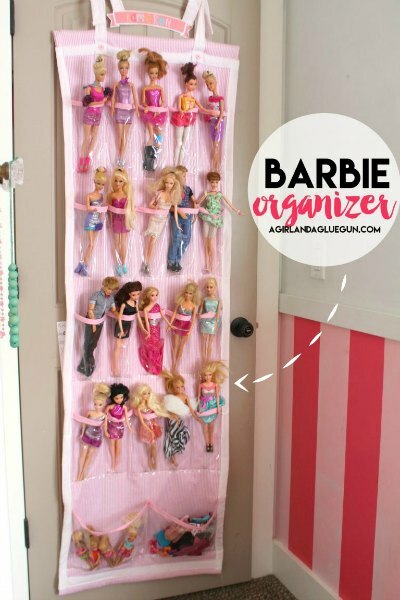 This handy over the door organizer works perfectly for barbie dolls too! You could also use this for hot wheels and more. 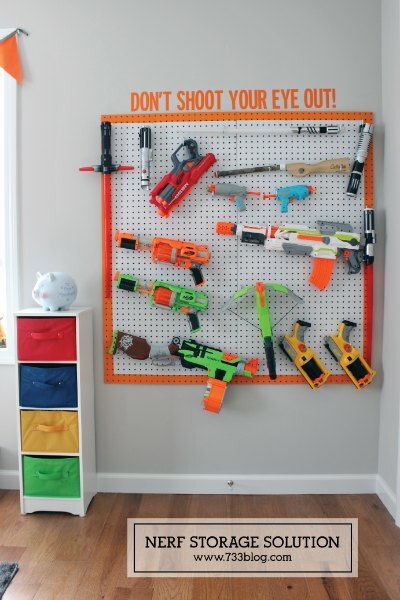 How cool is this nerf gun storage? This is the perfect thing to make so that all the nerf guns are not all over the place. This all starts with a peg board. Pick these up at Lowes or even Amazon has peg boards and have them shipped straight to your house. Yeah! No more hotwheels all over the place with this nifty idea. Use magnetic knife bars to make this project. So cool! Playing cards get so mixed up when the box becomes torn and they all fall out. Put each game into a separate box and use the case to label it. You can find small plastic boxes at Dollar Tree or even use old baby wipes containers. Amazon also has several small plastic bins to choose from as well. 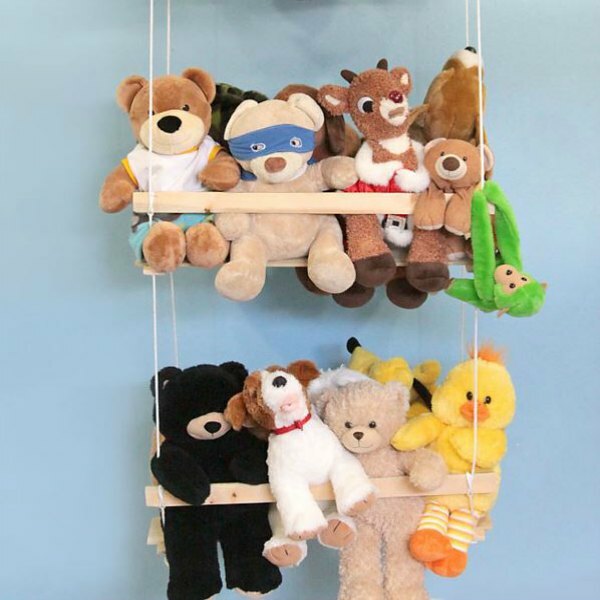 You don’t have to spend a ton of money on those fancy stuffed animal hanging bins. Make your own with this very simple tutorial. Plus, it’s so cute! There isn’t anything worse than trying to put your child in the bath and they are slipping on bath boys! 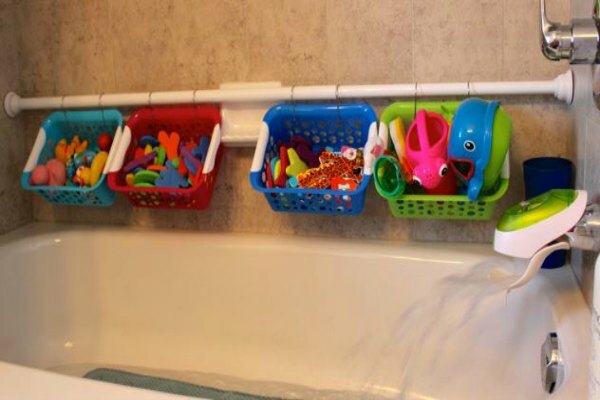 Make this easy storage idea that also allows the toys to drain. You just need a tension shower rod and some dollar store baskets. 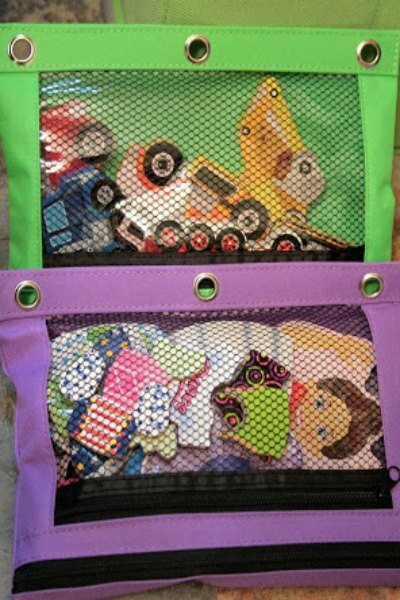 Make toy sacks with clear windows so you can easily see what is inside. This is perfect for taking toys on the go as well. So clever! Toys outside can be a mess too! 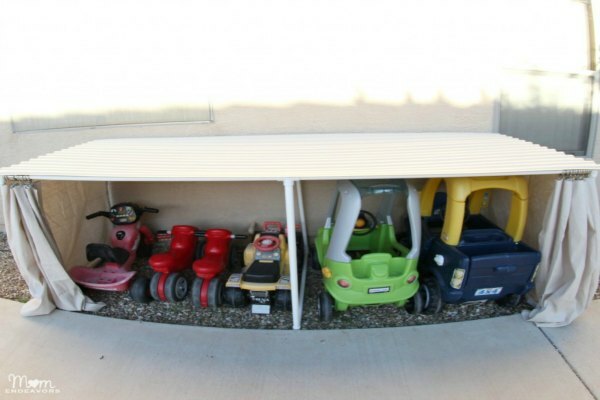 Make this garage dedicated to just the ride on toys! It looks so much better than having them all over the yard. Pick up plain old wood crates at your local craft store or order them on Amazon. You will be amazed at what you can make! 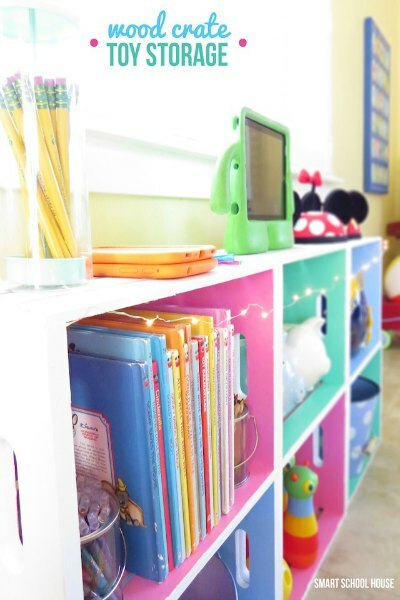 Use metal brackets to connect them to make storage for toys, books and more! 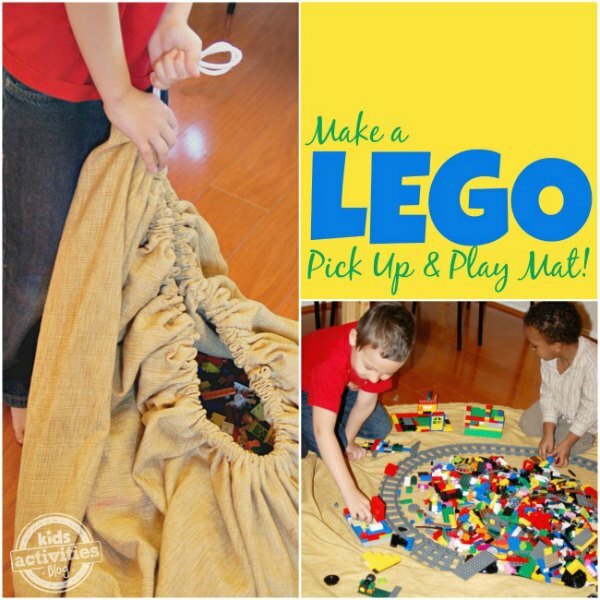 This lego play mat also doubles as storage! 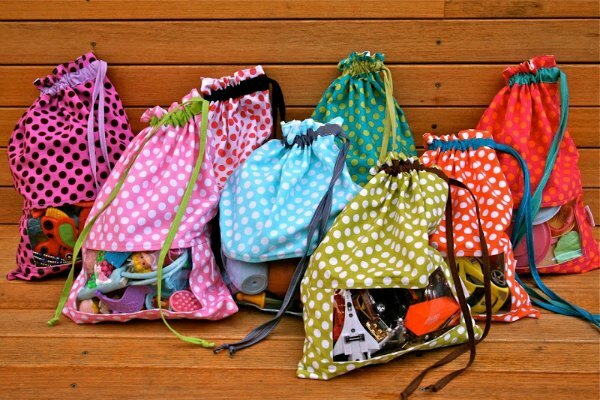 Simple use the drawstring to gather the fabric and clean up is a breeze. You a sturdy fabric or even a canvas drop cloth would work! I find these little pouches all the time at my local dollar store or you can buy a pack on Amazon. 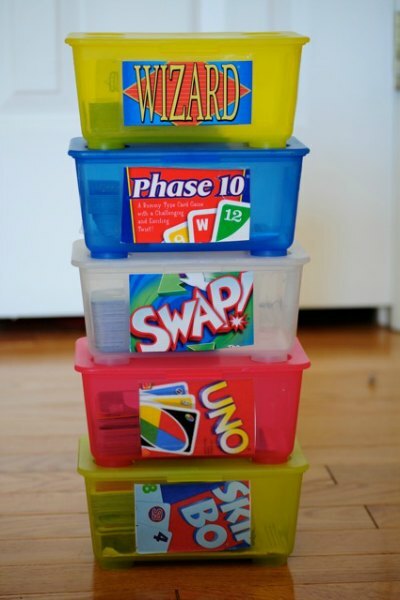 They make the best puzzle storage and it’s so handy. This idea doubles at seating AND storage! 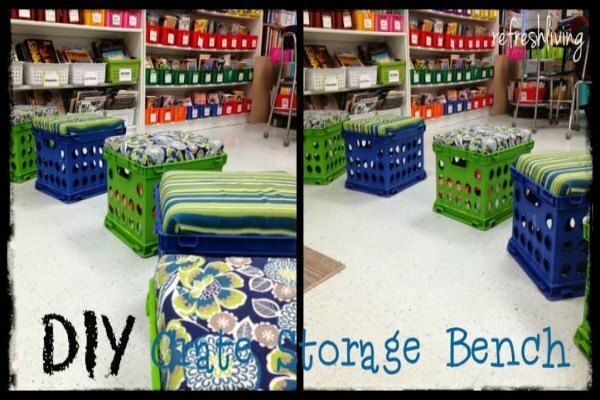 Use crates to store books and toys and make this cool cushioned top for extra seating! I love ideas that have a double purpose. 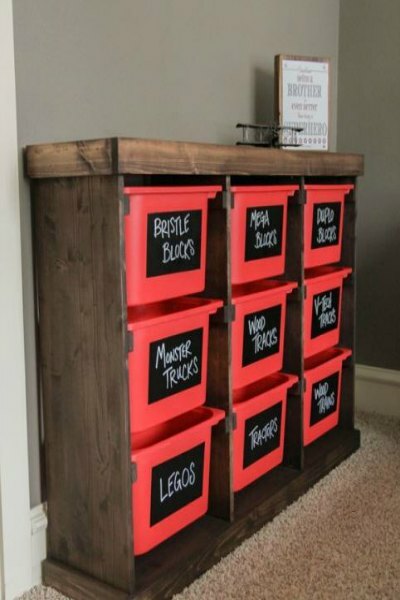 Who knew inexpensive storage baskets could turn into such a fabulous idea for storage? This idea is so clever and looks amazing. I love the chalk labels. 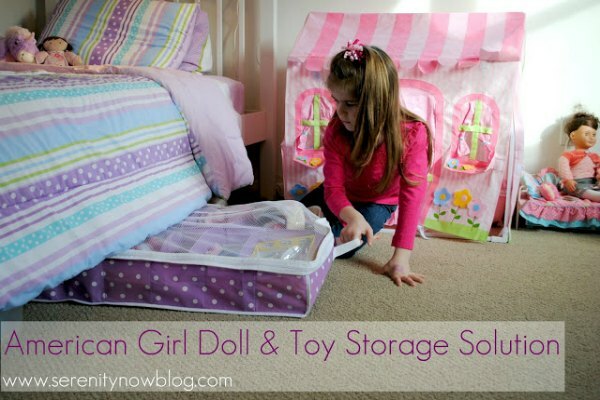 Which of the Easy Kids Toy Storage Ideas do you love? We have the Best Free Amazon Prime Movies for Kids! Over 60 movies that are included in Amazon Prime. This is perfect for traveling, family movie night and more! 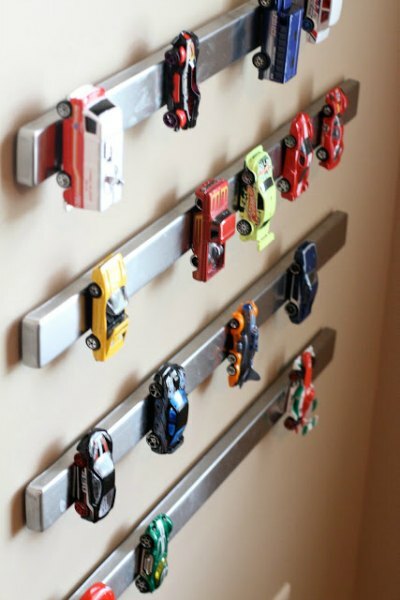 Love the idea on sticking magnets to the wall for the matchbox cars to attach on. These ideas are brilliant! Thanks a lot for sharing!